Loosing weight is always a challenge. But when it comes to loose weight quickly it is to top the Mt. Everest. So friends today i will tell you the recipes of some soups which will help you to loose weight fast within 2-3 months.. Weight loss is no less than a challenge in today’s time. If you are a bit weighing you will have to face people’s slick look and fervent comments. Although weight loss is not only necessary to look slim, but it prevents you from many diseases. If you do not lose weight after adopting all the methods and rules, then start drinking soup from today. Today, we are telling you about some soup whose consumption really low is very fast. The most important point is that if you stay busy and do not have time to lose weight then these soups can prove to be a very helpful option for you. Not only will you save time, but you will also get enough nourishment for your body. So let’s know about some soups losing weight. White bean soup is an important part of weight loss diet. Sugar, fat and sodium are found in very small quantities and it is quite nutritious. It is also very tasty. It is also very easy to prepare and contains a large amount of protein. Maybe you do not like broccoli, but it is an effective soup to lose weight fast. About 100 grams of broccoli soup is found to be around 1.2 grams of fat. Broccoli is full of fiber and essential nutrients. You can reduce unnecessary fat quickly and easily by gourd soup. It contains less fat and sugars and is a great source of protein and fiber. Mix chicken soup with brown rice in a fast weight lose soup is delicious, but sodium is low and protein is found in much quantity. 100 grams of brown rice soup with chicken had 0.7 grams of fat. To reduce the weight, you will be able to make the body even nutritious elements available by adopting green onions and potato soup. You can take a little fat light breakfast with multigrain bread. You can take carrot soup with ragi. Sugar is quite low in this. 100 gram soup weighing had 1.2 grams of fat. You can make your weight loss soup diet by adding your favorite vegetable to your normal pea soup. It is rich in protein and has less sodium and sugar as well as fat. Red Lentil soup is very healthy and it is full of protein, vitamins and fibers. Its weight is extremely effective for weight loss. 100 grams of lentil pulse had 0.8 g fat. It is also easy to make and it is also very tasty. 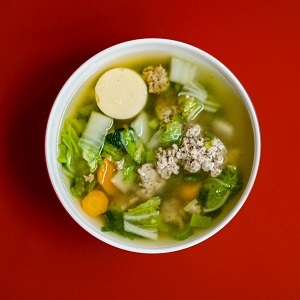 This weight loss soup diet will also provide you with essential potassium, protein and fiber. Fat and sugars are in less quantities and this is the best source of Vitamin C.
Previous Why To Avoid Eating Fine Flour In Hot Weather Countries?